This is an 8 inch high bust in a high fired bisque. Hand painted patina. The Albert Einstein portrait of this collection is a sensitively sculptured sketch which captures the serious and pensive physicist-scientist. Einstein, a German-born American theoretical physicist whose special and general theories of relativity revolutionized modern thought on the nature of space and time and formed a theoretical base for the exploitation of atomic energy. 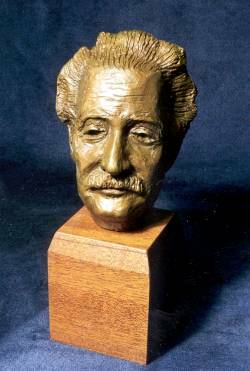 The Einstein bust is available in bronze. See picture below. Contact the artist, Robert Toth, for information and pricing.